General objective of this report is to analysis Foreign Exchange Procedures of Al Arafah Islami Bank Limited. Foreign exchange is the pivotal department to any modern checking. Foreign exchange department acts as a media between exporters and importers. Payments of foreign bills, FDD, FTT and all transactions in relation to foreign exchange of the lending company can be well described as foreign trade. General/Consumer Banking. General banking deals with retail banking services to customers. Banks perform this function in two ways-1 .taking deposits from various areas in different forms.2 1ending that accumulated amount of money to the potential investors in other different forms. General Banking is the starting point of the entire bank operating. General Banking department aids in taking deposits and simultaneously provides some ancillaries services. It provides those customers who come frequently and those customers who come one time in banking for enjoying ancillary services. In some general banking activities, there is no relation between banker and customers who will take only one service form bank. On the other hand, there are some customers with whom bank are doing its business frequently. It is the department, which provides day-to-day services to the customers. Everyday it receives deposits from the customers and meets their demand for cash by honoring cheques. It opens new accounts, demit funds, issue bank drafts and pay orders etc. since bank in confined to provide the service everyday general banking is also known as retail banking. Under General Banking Division, I was working as an intern in the front desk. This department mainly provides service by opening various deposit accounts, saving scheme to customers for a wide variety of purposes. They are always on the run to search for new customers. This report is based on finding out their way to satisfy the consumer as well as how AIBL is financially performing. My overall objective of AIBL financial statement analysis is the examination of financial position and returns in relation to risk. This must be done with a view to forecasting the firm’s future prospective. At the end part of the report I have stated some recommendations, which I hope will be helpful for ban to recover all the weaknesses. Islamic ideology encourages us to succeed in life here & hereafter. To achieve this success we must follow the way dictated by the HOLY QURAN and the path shown by Rasul (SM). With this goal in view Al- Arafah- Islami Bank Ltd was established (registered) as a public limited company on 18 June 1995. The inaugural ceremony took place on 27 September 1995. The authorized capital of the Bank is TK.5000.00 million of which the paid up capital is TK. 1,798.00 million. Some very renowned Islamic personalities and pious businessmen of the country are the sponsors of the bank. The total paid up capital was invested locally. The Bank is committed to contribute significantly in the national economy. It has made a positive contribution towards the socio economic development of the country by opening 60 branches of which 17 authorized dealer (AD) throughout the country. The equity of the bank stood at TK.3,564 million as on 31 December 2010, the manpower was 1,296 and number of shareholders was 11,382. The Bank conducts its business on the principles of Musaraka, Bai-muazzal, and hire purchase transactions approved by Bangladesh Bank. With the objective of achieving success here & hereafter by pursuing the way directed by Allah and the path shown by His Rasul (SM), Al Arafah Islami Bank Ltd was established (registered) as a private limited company on 18 June 1995. The inaugural ceremony took place on 27 September 1995. The authorized capital of the Bank was Tk.5,000.00 million and the paid up capital was Tk. 1,798 million as on 31.12.2010. 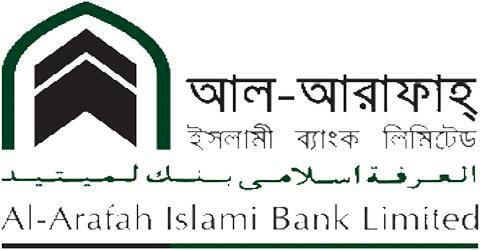 Renowned Islamic Scholars and pious businessmen of the country are the sponsors of the Bank. 100% of paid up capital is being owned by indigenous shareholders. The equity of the bank stood at Tk. 3,564 million as on 31 December 2010, the number of employee was 1,296 and the number of shareholders was 11,382. It has achieved a continuous profit and declared a good dividend over the years. High quality customer service through the integration of modern technology and new products is the tool of the bank to achieve success. The bank has a diverse array of carefully tailored products and services to satisfy customer needs. The Bank is committed to contribute significantly to the national economy. It has made a positive contribution towards the socio economic development of the country with 60 branches as on 31.12.2010 of which 17 is AD (Authorized Dealer) throughout the country. At the end of financial year 2010, the number of depositors stood at 3,43,273 and the amount of deposit has accumulated to BDT 38,355.50 million. The total amount investment extended to a sum of BDT 36,134.08 million. The investment income was BDT 4,004.54 million during the year 2010 which registered a growth of 15.86% over the previous year. Investment income is 75.48% of the total income of BDT 5,305.63 million. The bank has the depositors BDT 2,667.34 million which is 66.61% of the investment income and 74.59% of the total expenditure for the year 2010. It indicates 20.13% growth over the year 2009. -Inefficient and Madrasha Educated manpower -Revenue driven target or goal. -Efficient and University educated manpower. Islamic banks render almost similar services to their customers that conventional banks do. However, differences exist in administering incentives for depositors and charging for capital investments, in so far as techniques of calculating the incentive or the cost of the capital are concerned. Like a conventional bank, AIBL also accepts deposits from customers and advances loans. The bank invests its funds for short as well as long term deposits. AIBL perform mainly three different types of functions. Foreign exchange is the means and methods by which rights to wealth in a country’s currency are converted into rights to wealth in another country’s currency. Foreign Exchange Department is the international department Bangladesh Bank issues license to scheduled banks to deal with foreign exchange. These banks are known as Authorized Dealers. If the branch is authorized dealer in foreign exchange market, it can remit foreign exchange from local country to foreign countries. So Al-Arafah Islami Bank (AIBL), Principal branch is an authorized dealer. A letter of credit is a letter issued by a bank (known as the opening or the issuing bank) at the instance of its customer (known as the opener) addressed to a person (beneficiary) undertaking that the bills drawn by the beneficiary will be duly honored by it (opening bank) provided certain conditions mentioned in the letter have been complied with. Customer application for opening L/C with indent or proforma invoice. Proposal preparation as per circular security of papers submitted by the importer (list of papers). Sanction of proposal- Terms and conditions. Security of LCAF, LCA, IMP, L/C advice copy. Realization of margin, commission, postage charges, register entry numbering, passing of voucher. Passing of L/C by airmail, cable tale transmission, SWIFT. Advising or Notifying Bank It is the bank through which the L/C is advised to the exporters. This bank is actually situated in exporter’s country. It may also assume the role of confirming or negotiating bank depending upon the condition of the credit. Negotiating Bank It is the bank, which negotiates the bill and pays the amount of the beneficiary- The advising bank and the negotiating bank may or may not be the same. Sometimes it can also be confirming bank. The goods and services sold by Bangladesh to foreign households, businessmen and Government are called export. The export trade of the country is regulated by the Imports and Exports (control) Act, 1950. There are a number of formalities, which an exporter has to fulfill before and after shipment of goods. As a negotiating bank, it negotiates the bills and other shipping documents in favor of the exporter. That is it collects proceeds of the export bills from the drawer and credit the exporters account for the same amount. Sometimes bank purchase the bills at discount from the local exporters and waits till maturity of the bill. In times of maturity, bank presents it to the drawer to Ancash. Under this arrangement AIBL an export by opening a letter of credit on be half of the exporter who has received a letter of credit from the overseas buyer but is not the actual manufacturer or producer of the exportable goods. The letter of credit is opened in favor of the actual producer with in or outside the country. Since the second letter of credit is opened on the strength of, and backed by another letter of credit it is called back to back credit. The need for back to back credit arises because the beneficiary may have to procure the goods from the actual producer who may not supply the goods unless its payment is guaranteed by AIBL in the form of letter of credit. Valid Import Registration Certificate (IRC) and Export Registration Certificate (ERC). L/C Application and LCAF duly filled in and signed. In case of maturity of back to back LC of 60-90-120-180 days, deferred payment is made. Payment is given after realizing export proceeds from the L/C issuing bank. Packing credit covers the credit extended by AIBL to the exporters prior to the shipment of the goods. Such credit is guaranteed to the exporters for the procurement and processing of raw materials, manufacturing of finished products, packing or transporting goods meant for export to foreign country. Such facility is allowed to an exporter just at the time when he has foreign buyers order by the way of confirmed export letter of credit. When the order is executed, the packing credit gets paid out of the proceeds of the bill drawn on the foreign buyer. Post-shipment credit is given to the exporters by AIBL after the actual shipment of goods. The necessity for post shipment finance arises because the exporters who have shipped goods have to wait for a long time for receiving payment from the overseas buyers, the period of waiting depends on the terms of payment. The exporters need fund to carry on normal export activities. Finance is required for these activities. AIBL generally finance exporters at post shipment stage on verification of the credit worthiness and financial soundness of both buyer and the seller. International trade takes place between seller and buyer located in different countries. The parties to a trade transaction are not always known to each other. Even if they are known to each other the seller may not have the full confidence in the credit worthiness of the buyer or the buyer may not like to pay before he actually receives the goods. Under a banker’s letter of credit the issuing bank (AIBL) gives written undertaking on be half of the buyer that the bank will honor the obligation of payment or acceptance on the presentation of stipulated documents. Importer bank issue the letter of credit at a margin prescribed by the Government. This margin varies from commodity to commodity. According to government instruction the bank does not generally issue letter of credit less than at 50% margin. The document should be presented for negotiation before expiry of the credit. The amount of bill should not exceed the amount authorized in the L/C. All the documents asked for in the L/C have been submitted. Operation activities for import section: Officers in L/C opening desk process L/C application. Internal Approval- It is made for those importers who are enjoying L/C limit facility for a period of 12 months approval by head office. Head Office Approval- Proposal made on case to case basis in a detail format for those importers during their initial 3 to 6 months period. Satisfactory performance in the account would enable them to avail full fledge credit line on 12 month basis. An L/C number is provided. Opening charges or commission recovered. Charges and liability vouchers are passed. Preparation and checking of L/C body in accordance with pro-forma (PI) invoice or indent. At the end of 2010, the total amount of foreign trade was 60,453.18 million Tk showing a growth of 8.85%. The total export of the bank was 20,176.64 m Tk in 2008, which has increased by 16.70% to 23,546 m Tk in 2009. Similarly the amount of import has increased from 32,685.13 m Tk of 2008 to 34,074.80 m Tk in 2009. Experiencing a a growth 0f 4.25%. This bank is authorized dealer to deal in foreign exchange business. As an authorized dealer, a bank must provide some services to the clients regarding foreign exchange and this department provides these services. The basic function of this department are outward and inward remittance of foreign exchange from one country to another country. In the process of providing this remittance service, it sells and buys foreign currency. Outward remittance covers sales of foreign currency through issuing foreign T.T. Drafts, Travelers Check etc and as well as sell of foreign exchange under L/C and against import bills retired. The performance of foreign remittance shows an increasing trend from 2005 to 2009. It can be seen from the chat that there is a sharp improvement in the performance from 2005 to 2008. The relationship with immediate supervisor was very friendly. Always he used to take care about all of the official works. He also tried to train me by providing updated information to ensure a better performance. When ever I was busy in providing information to existing clients and at the same time new account holders who were interested to open an LC, he used to make my job easier. While putting entries manually in different register books, supervisor used to cross check if any mistake has been made. If any mistake was found, then he (supervisor) helped to catch up the mistake and made it right. His politeness and cooperation helped me to continue my work smoothly with satisfaction. The level of responsibility was very crucial in making manual entries in the register book.. Under foreign exchange department I had to maintain four to six register books every day. On each register book I had to input transaction amount with transaction detail of an L/C, which is more then on an average BDT 2,000,000. So, any minor mistake might lead to a big loss for AIBL. Due to a wrong entry AIBL might lose its potential clients, because this is a sensitive issue to directly affect customer loyalty. The principle officer used to recheck these entries to find out whether there are any discrepancies. If any mismatch with manual entries and software records were found, supervisor used to send it back to me for a recheck. These manual entries and examination of proper documentation were quite sensitive task to handle. There are a number of tasks that I had to perform under foreign exchange department of AIBL. Finding out files of a specific party was a difficult task to manage. Documents and files of different clients were not sequentially arranged according to the maturity date. There fore lots of time is being spent in arranging and finding out thousands of files. More over different business clients used to come at a time to take their payments. As records of all parties were maintained in one record book, so it was time consuming to find out the maturity date of each party. On the other hand maintaining a single register book for all parties enable one party to wait for the other. Hence, convincing client was a critical job. After arrangement of every thing payment to client is to be made. This payment making is another complex task. Before making payment I had check the balance of foreign currency account. Based on the sufficiency of I had to make payments. These payment were done by FDD foreign demand draft. Any minor mistake in FDD block would lead to a severe loss to AIBL. There the task required full attention and accuracy. Working under foreign exchange department of AIBL enabled me to gather some valuable experiences. One of the major skills that I have acquired is how to work under a team of experienced employees. With in the team of fifteen members each person had different mentality. I had to be very dynamic and compromising in order to cope up with the team. More over in handling clients I have acquired fluency in speaking and convincing power. Continuous dealings with client’s problems and enquiries gave me an idea of which technique to apply to satisfy clients. Finally, I could learn the importance document arrangement to build a smooth working environment. Tasks that I handle were quite important and sensitive. As I choose to work in foreign exchange department, I had to maintain all important documents including L/C opening, FBP, FBC register books. These tasks ultimately reflected the bank’s accuracy and affectivity. A minor mistake might lead to severe losses. Though all records were maintained by AIBL’s own different soft wares, but these manual entries helped them to cross check the accuracy of the data at the end of the day. More over another important to play in this department was the examination of L/C form. An L/C form checked by me ensured its accuracy. Only checking L/C form was not sufficient, at the same time I had to motivate and guide a client to think about why AIBL is different from other commercial banks. Consumer loyalty partly depended up on my behavior and the quality of information provided. This ensures whether the client would return to avail the service and make next transaction. Hence, handling this job was quite sensitive. The working environment is not well organized. Furniture and other necessary tools of foreign exchange division are not properly arranged therefore it becomes difficult for the clients to share their information. Therefore, tasks become lengthy and time consuming. The organizational hierarchy is tall therefore decision making process is very slow. If there is any requirement for repair and replacement then the branch manager has to wait for a long time to get the support. More over sometimes clients also have to suffer for this lengthy decision making process. The record keeping system is manual and backdated. Therefore time is wasted in recording several L/C documents in register book. Moreover like other banks there is no separate recording book for each party. All are recorded in a single register book so; one business client has to wait for the other. The banking system of AIBL is not modernized in compare to other rivals in the competitive market. The bank dose not has ATM facilities therefore clients don’t have the option of withdrawing money any time from any where. Therefore, a large portion of customer is out of reach. It takes more time to open up L/C due to the shortage of authorized dealer (AD) branches. Lack of delegation. Branch manager fails to take immediate action in order to accelerate banking activities due to lack of sufficient power. The organization does not provide any extra incentive for showing extra ordinary performance. Therefore, the tendency of showing better skills does not exist. The recruitment and selection process is mostly fair but too much time consuming and lengthy. It take two to three months for a recruitment. There is no policy to ensure better relationship and coordination among employees. More over one way communication don’t allow employees to share their opinion and feedbacks with the top management. AIBL as an organization in Islamic banking it is committed to avoid interest. Therefore, even though there are many profitable projects available but it cannot invest the permissible part of its statutory liquidity reserves and short term liquidity surplus in these sectors. In order to ensure better progress of AIBL in future, some necessary steps are recommended bellow on the basis of collected data, observation, client’s opinion, and my personal judgment. AIBL of Uttara should go for internal readjustments. The management should enhance their service of foreign exchange department by ensuring a proper rearrangement of furniture and other logistical supports. This readjustment would ensure fast and better service to the clients. Automated Teller Machine (ATM) should be introduced as soon as possible. This is because with out this facility a large portion of client is out of reach. Now a days educated clients are looking for modern automated banking service. The bank should go for aggressive advertisement and undertake several promotional activities to get hold over large portion of the market. It would help to collect more deposits and investment scope. The entire department should be informed regarding their goals and objectives. It is essential to turn company objective in to individual target. A philosophy of working for the customer instead of working for boss must be introduced. It is observed that officers have to spend more time in preparing vouchers. This must be avoided through automation. In foreign exchange section individual record book need to be maintained for each party, so one party don’t have to wait for the other. Branches of AIBL are not sufficient as per demand of the people, so the management should concentrate on setting up more branches. The bank has the provision of internship but is no organizational program to train interns. The management can come up with such programs to help an intern in gathering valuable experience. Job description should be clarified and proper training facilities should be insured to improve the performance of the bottom line management. The management should always monitor the performance of its rival in the field of foreign trade. This would enable them to remain updated. An official training regarding SWIFT must be insured. The management can follow flat organizational hierarchy in stead of tall. This would enhance decision making process. Moreover delegation should be decentralized so that branch managers can take decisions at a short notice. Bangladesh is a developing country and its economy has changed enormously in the last decade. This change has raised the need for better banking facilities. To meet this increasing need a number of private commercial banks, nationalized commercial banks and foreign banks operating their activities in Bangladesh. Al-Arafah Islami Bank is one of them. It is a great pleasure to have practical exposure to AIBL uttara branch. It helped me a lot to be a professional banker in near future. Foreign exchange is the pivotal department to any modern banking. Foreign exchange department acts as a media between exporters and importers. Payments of foreign bills, FDD, FTT and all transactions relating to foreign exchange of the bank can be well explained as foreign trade. AIBL is serving a large number of clients in Uttara branch. Its foreign exchange department is quite busy. Turag garments, XL-composite, One way, Robin garments, Skamp garments are some of the potential clients of AIBL foreign exchange. Total export and import performance of Uttara branch is increasing in last five years tremendously. The number of opening export and import LC has also increased. Foreign exchange procedures are more or less well organized and management is trying their best to satisfy their clients. Bank always contribute towards the economic development of a country. In compare to other banks, AIBL is contributing a significant portion by investing more of its fund in fruitful projects leading to an increase in production of the country. It is obvious that right channel of banking establish a successful network over the country and increase resources. AIBL is playing its leading role in socio-economic development of the country. Since inception, AIBL has been rendering its banking service with the needs of the nation to cope with the demand of the people in the country.